First Listen: Sounds of Blackness singer Jamecia Bennett looks for the "Man 4 Me"
(January 10, 2018) You may or may not recognize the name Jamecia Bennett per se, but if you're 30 and up, you know her voice and her legacy. She's long regailed R&B fans as a lead vocalist of Grammy-Award-winning group, The Sounds of Blackness, is the daughter of vocal powerhouse Ann Nesby and the mother of American Idol contestant Paris Bennett. In other words, to put it mildly, a sister's got pipes. A veteran performer whose showcased her gifts as a background vocalist (Lalah Hathaway, Aretha Franklin, Jonathan Butler, Prince) and in dozens of off-Broadway shows (most recently as Nina Moseley in Love Jones The Musical), Bennett is back with "Man 4 Me," an organ-fueled, gospel-inflected slow burner meant to pump the brakes and deflate the ego of a player who didn't quite make the final cut; "I thought you ended my search, so much for first impressions/you won't get a second. Now all you get is my apology, sympathy/and one goodbye kiss from me, cuz' we're just not meant to be." Jamecia tell us: "'Man 4 Me' is the first single I’ve released in years it’s kinda my reintroduction to the industry I love and value so much that has brought me some tough times but also that has brought me so much success through the many years. The song was written by two great and talented friends of mine, Mike De’Cole and J Isaac, who are also great artists themselves." New Year's is a usually time of reflection and change: even if there isn't a partner you need to put into the 'ex column,' adding "Man 4 Me" to the playlist will bless the ears, enrich the soul and adds yet another worthy contribution to Jamecia Bennett's already-enviable career. 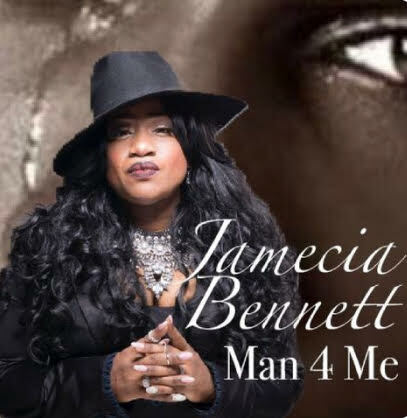 Jamecia Bennett - "Man 4 Me"